Sitting down is French philosopher, Jacques Derrida. Derrida replaces Heraclitus and Michaelangelo from the Raphael work. 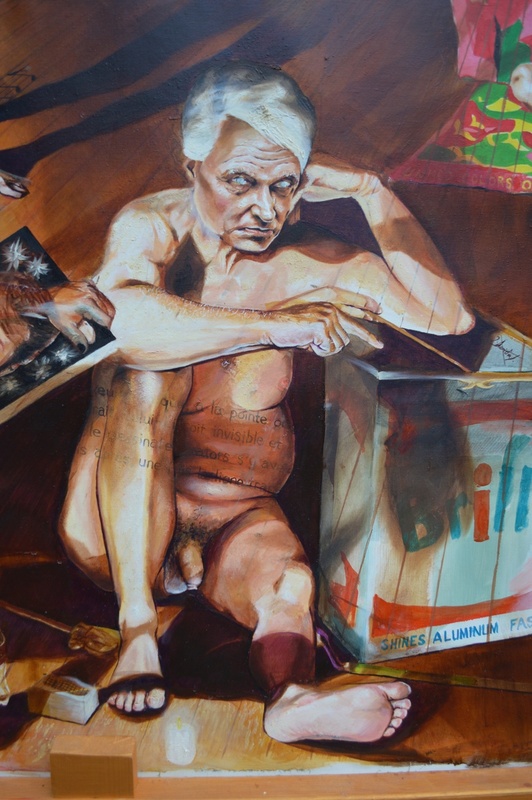 Derrida curated an exhibition of drawings at The Louvre in 1990. The opening image was Joseph-Benoit Suvee’s ‘Butades,’ or ‘The Origin of Drawing.’ (1791) In it a young woman Butades in coming to terms with separation from her lover, traces his shadow on the wall. Derrida said this was also the case in drawing. The artist cannot see the model and the canvas at the same time. ‘It comes from a tradition in which the origin of drawing is attributed to memory rather than perception. The narrative relates the origin of graphic representation to the absence or invisibility of the model.’ (Derrida) The artist in a sense, is always blind. Therefore, in the painting, we have a blind Derrida next to a blind man’s white stick. (The white stick plays with the image of a painter’s mahl stick.) He is tracing a shadow on his drawing since Derrida has said that drawing, like language, is impossible without the play of the trace.